Organize. The first step of managing your time is organizing your time. When I say organize, I don’t just mean color coordinating notebooks and planners. Have a calendar on which you write sport AND school events. Make “to-do” lists and determine which items are the most important—complete these first. Plan ahead. Classes and practices are bound to interfere with one another. Before this happens, carefully look over your comprehensive schedule. When you come across a conflict, be proactive. Immediately inform your coach and professors, and let them know what your situation is. All parties will respond more graciously if you inform them well in advance—that’s a guarantee! Communicate. You are not the first student-athlete to struggle with time management. Coaches and professors have taught many just like you, so don’t be afraid to reach out to them. Not only is this suggested, it’s completely necessary! No one can read your mind, so you need to advocate for yourself. Let someone know if things seem to be getting out of hand. Coaches and professors are not only here to teach; they are here to help. Let them. Make time for yourself. This is much easier said than done. However, it’s the most important. If you don’t take care of your body, you will underperform in school and sports. Taking care of your body doesn’t only pertain to diet and exercise, but also sleep habits, stress control, and mental health. Bad habits are easily formed and their negative consequences are unavoidable. If you aren’t sure how to be healthy in all the aforementioned aspects, talk to a captain or coach, or stop by the Wellness Center. If you have practiced all of these strategies, and you still feel overwhelmed, take a moment to consider your options. Ask yourself why you are playing the sport in the first place. Playing a collegiate sport is a lot of people’s dreams, but the reality is that it’s not for everybody. Make sure you are playing for yourself and not for anyone else. Play for the right reasons, and don’t settle for anything that makes you less than happy. Finally, sit back and enjoy the ride. These years fly by, and it’s important you enjoy each one of them. Please, always remember, you are never alone in this crazy college world. 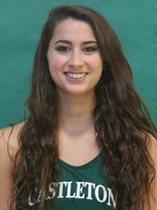 Christiana Carmichael is a senior Education Major and four-year collegiate athlete. Sign-up to receive notifications about new posts! Saving Money this Summer: Yes, It’s Possible! Copyright © 2019 Castleton University. All rights reserved.